Middle Eastern flavours spice up a no-fuss chicken dish. This one is a throw-together recipe with no fuss but loads of flavour. You can break down a whole chicken and use all the pieces, but for convenience we use thighs and drumsticks. They're usually less expensive than breast and stay juicier. It's really important to get your pan nice and hot to crisp the skin which adds more flavour. Try preserving your own lemons (the flavour is fantastic) or store-bought is fine. For the dukkah, mix the cumin, coriander and fennel seeds with the macadamia nuts. Heat the grapeseed oil in a large pot on a high heat, season the chicken pieces with salt and brown in the oil. Remove the chicken, brown the eschalots and Jerusalem artichokes for two minutes, then add the chilli and garlic and gently brown for another couple of minutes. Reduce the heat and add the chicken stock, preserved lemon, currants, thyme and amaranth. 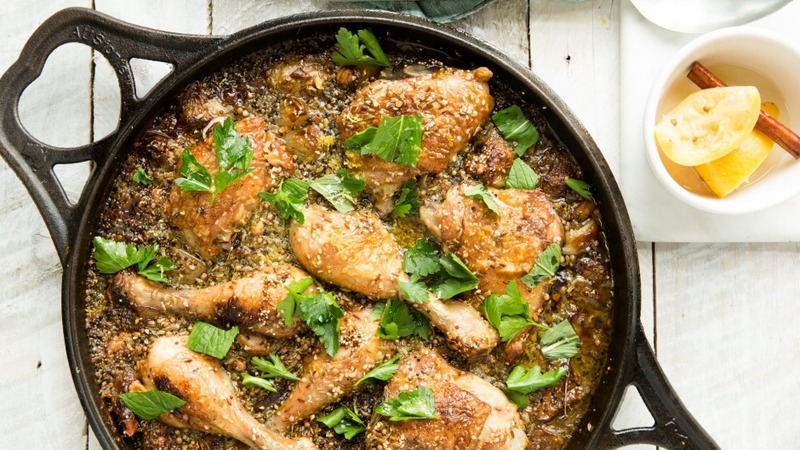 Put the chicken on top, drizzle over the olive oil and sprinkle with dukkah. Cook in the oven for 40 minutes – the amaranth will soak up a lot of the stock. Remove from the oven, throw over the herbs, give it a squeeze of lemon and serve.